A trash compactor truck with four 360-view cameras, side guards and enlarged side mirrors. 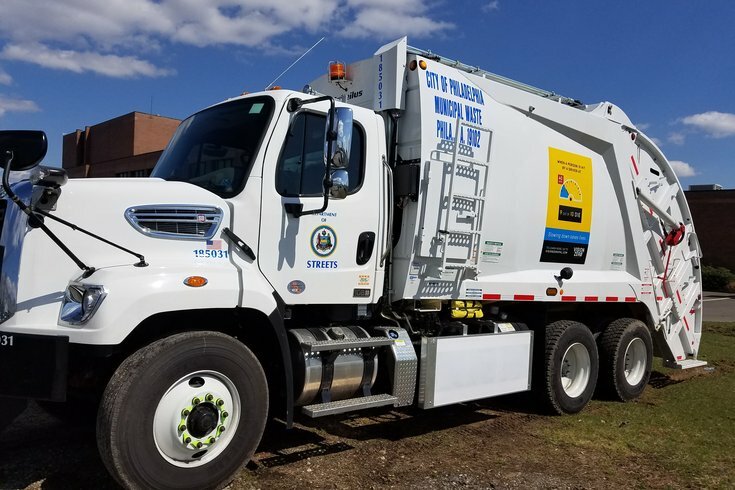 The Philadelphia Streets Department announced Wednesday every new trash compactor truck it purchases will be upgraded with four 360-view, day- and night-vision cameras, side guards and enlarged side mirrors. The safety upgrades come out of the 2017 Vision Zero initiative and three-year plan, which includes making the city’s fleet of 6,000 vehicles safer in an effort to reduce traffic deaths. Philadelphia has one of the highest rates of traffic-related deaths, compared to our peer cities. And every year about 10,000 traffic crashes occur on our streets, killing about 100 people and severely injuring 250. Last November the death of a 24-year-old cyclist who was killed in a collision with a garbage truck at 11th and Spruce streets sparked enormous outrage from the cycling community. Activists have been lobbying for safer streets, more bike lanes and education surrounding street safety — with the addition of a Vision Zero plan — for years, according to the Bicycle Coalition of Greater Philadelphia. Immediately following the incident, the BCGP demanded seven safety measures be taken — the addition of side guards to trucks as one of them. This announcement has been hailed as a success by the coalition, but in a recent post on its website, BCGP pointed out that most of these truck-related deaths are pinned to drivers from private companies, and not drivers from city-owned trucks. "So, while requiring side guards on public city vehicles is good, Philadelphia should, like New York City, set a deadline for all private vehicles doing business in the city, to install side guards on their vehicles," reads a recent post on BCGP's website. Moving forward, the coalition will be researching in what ways policy can "force private companies to comply with commonsense safety regulations," the post states. According to a Vision Zero report, these kinds of trucks in New York City merely comprise 3.6 percent of vehicles, but are responsible for a staggering 32 percent of bicycle fatalities and 12 percent of pedestrian fatalities. These fatalities occur when a pedestrian is swept under the tires of a large truck. With the addition of side guards, or panels installed between the wheels of large vehicles, officials have been able to mitigate those incidents. Side guards have been used in Europe, Japan and South America since the 1980s. Apparently the Streets Department has been testing the enhancements over the past few months and plans to purchase 34 more vehicles in 2019 with the upgraded safety features. These safety enhancements, however, will only be added to newly-purchased trucks and not added to pre-existing trash compactor trucks. And right now, there are currently only two trucks in operation with one or more of these added safety features, according to the Mayor’s office. The cost of upgrades on new trash compactor trucks is a bundle cost of $8,000, for a total of $280,000 annually. But not all trucks will get all the upgrades. Cameras, side guards and cross-view mirrors will be added to all newly-purchased trash compactor trucks, and side guards and mirrors will be added to any new truck purchased, not just trash compactor trucks.